How does ponded water affect corn and soybean and soybean growth and development? 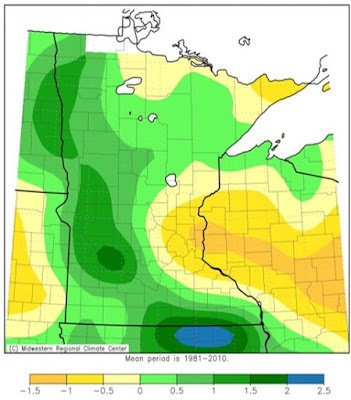 June 1 through 15 saw above normal rainfall. 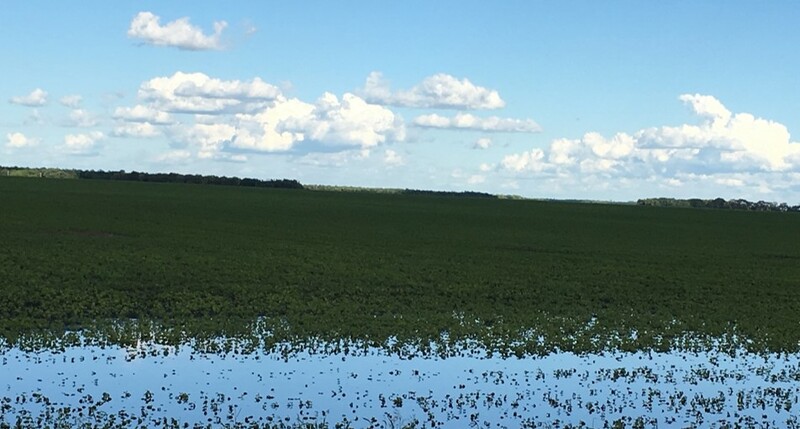 Frequent and significant rainfalls can remind crop producers of several things: 1) which fields are good candidates for tiling, 2) where grassed waterways need to be established or repaired, 3) that it might be time to chat with the crop insurance agent. The ponded areas in some fields should have come as no surprise given the rain that has accumulated so far in June 2018 (Figure). Figure. Ponded water in a NW MN soybean field. Since June 1 the University of Minnesota’s Northwestern Research and Outreach Center in Crookston has accumulated 4.07 inches of rain and much of the region has accumulated between 1 and 1.5 inches more rain than the 30-year normal (Figure, MRCC, 2018). Figure. Departure from 30-year average precipitation (in inches) for June 1-15, 2018. Source: cli-MATE, Midwestern Reg. Climate Ctr. Illinois State Water Survey, Prairie Research Inst., Univ. of Illinois. Online. Accessed: June 15, 2018. What flooded soils does to developing plants. The dangers to plant roots from flooded soils are many. Flooded soils quickly become devoid of oxygen which is essential for proper root function. Through photosynthesis, green plant tissue uses the sun’s energy to convert carbon dioxide and water to oxygen and glucose. Respiration is sort of photosynthesis in reverse – oxygen and glucose are converted into energy (and carbon dioxide and water) that is used to run the machinery of plant cells. On a typical day there is a balance between respiration and photosynthesis. On sunny days more photosynthesis than respiration occurs, allowing plants to make the building blocks essential for growth and development and eventually contributing to yield. All of the organisms that live in soil need to respire in order to live and function. This includes many bacteria, and soil-living fungi, nematodes, insects and plant roots. Flooded soils quickly become oxygen-free (anaerobic) environments that do not support aerobic respiration. In the absence of oxygen, respiration still continues to occur in the soil and in roots, but this anaerobic respiration leads to the build-up of substances like ethanol and organic acids that are toxic to plant cells. Additionally while an anaerobic soil environment certainly does not favor normal cellular functions, root growth or development, prolonged oxygen deprivation can lead to cell or root death or even death of the whole plant. Corn. Corn is very vulnerable to damage from flooding plants are younger than the six-leaf (V6) growth stage and the growing point is still below-ground. Only 3 or 4 days of being submerged can be fatal to these young plants. Throughout much of NW MN in very few fields are plants with more than three or four (or even five) leaf collars, meaning that their growing points remain below ground and vulnerable (Figure). According to university agronomists, when flooded survival of these young plants is heavily dependent upon air temperature with plants unlikely to survive for longer than 24 hours when temperatures are greater than about 77 degrees, but plants may be able to survive for up to 4 days when temperatures are lower (Elmore and Abendroth, 2007). Figure. Ponded water in a NW MN corn field. Even if corn has reached the six-leaf stage and is able to survive flooding, root growth and development may be significantly retarded and unable to access enough water and nutrients during the critical reproductive stages of growth. There may also be concerns with soil nitrogen availability as flooding can lead to nitrogen loss through denitrification. Soybean. Flooding can also be detrimental to both soybean root growth and function and nodule formation and function. Without proper nitrogen fixation, soybean leaves can begin turning yellow. Research has shown that photosynthesis can be reduced by one-third within 48 hours after flooding (Oosterhuis et al. 1990). Reduced photosynthetic rates can slow dry matter accumulation both during and after flooding resulting in lost yield. Photosynthesis and dry matter accumulation can resume once water has drained away. Bennett, J.M. 1984. Drought and flooding effects on N2 fixation, water relations and diffusive resistance of soybean. Agronomy Journal. 76: 735-740. Drew, M.C. 1983. Plant injury and adaption to oxygen deficiency in the root environment: A review. Plant and Soil. 75: 179-199. Elmore, R. and Abendroth, L. 2007. Corn survival in flooded or saturated fields. Integrated Crop Management Encyclopedia article. Iowa State University Extension. Online. Accessed June 15, 2018. Oosterhuis, D.M., Scott, H.D., Hampton, R.E. and Wullschleger, S.D. 1989. Physiological responses of two soybean (Glycine max) cultivars to short-term flooding. Environmental and Experimental Biology. 30: 85-90.